With Robert Lewandowski in imperious goal-scoring form, Poland are favourites to progress to Round of 16 from Group H. Here's a look at some of their key players in Russia. Poland qualified for Fifa World Cup finals for the first time in 12 years, thanks to Bayern Munich striker Robert Lewandowski's chart-topping exploits. Adam Nawalka's men topped Group E in European qualifying, thereby clinching a comfortable passage to Russia. Barring a 4-0 defeat in Copenhagen, Poland were more than impressive in their qualifying campaign. Poland will open their campaign against Senegal on Tuesday, June 19. Having drawn in a relatively easier group (H), which also has Colombia and Japan, the European side are favourites to reach the pre-quarter-final stage of the tournament. Nawalka has created a hard-working unit ever since taking over the reigns of the team after their failure to qualify for Fifa World Cup 2014 in Brazil. The 10th-ranked team has the resources to go deep in the tournament this year, provided they come good at the right moments. 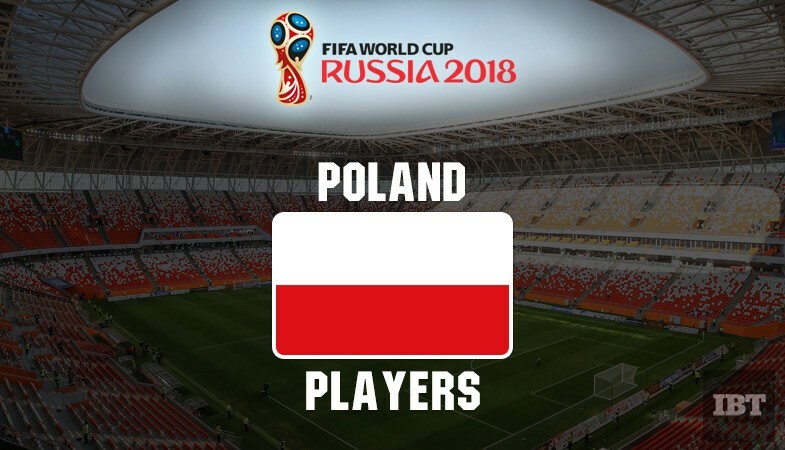 IBTimes, India has compiled a list of players who are likely to play a key role in Poland's World Cup campaign in Russia. Check them out below. The Bayern striker is at the peak of his prowess and played a pivotal role in leading his team back into the World Cup finals. With 16 goals, one more than the Portugal forward Cristiano Ronaldo's tally, he became the first player to score as many goals in a single European World Cup qualifying campaign. Lewandowski is capable of mounting a challenge for the Golden Boot but his team needs to go deeper in the tournament for him to do so. The leading scorer for Poland, with 52 goals, has arrived in Russia after scoring 41 goals for his Bundesliga side last season. The Juventus goalkeeper, the successor of Gianluigi Buffon at Turin, has established himself as the first-choice goalkeeper for Poland. He had missed most part of Euro 2016 campaign with an injury but seems to be ready to impress in Russia for his national team. Having moved to Italy from Arsenal in 2015, Szczesny proved his worth with some outstanding performances in the 2016/17 for Roma on loan. All eyes will be on the 28-year-old as he will be expected to continue his good work in Russia. The Napoli youngster seems to be one of the most exciting young midfielders in Russia. Known for his speed and vision, the 23-year-old had a fine season at the Serie A club, which finished second, four points behind winners Juventus. Having played all qualification matches for Poland, he will be integral to Nawalka's plans in Russia. The tall center-back is an influential figure in Poland's defence. His exemplary work-rate and tackling abilities were at the display when he played a key role in Monaco's Ligue 1 title-winning campaign in 2016/17 season. Poland lacked a bit of defensive discipline in the qualifying campaign, finishing with the worst record among European group winners and thus the onus will be on Glik to step up and marshal the defensive line.